At Bunloit Farmhouse, it’s all about the location. If you want to get away from it all, enjoy peace and solitude, and immerse yourself in natural surroundings, then this unique holiday cottage could be just right for you. As you approach along the winding, single-track, gated lane you’ll start to get a glimpse of what’s in store. 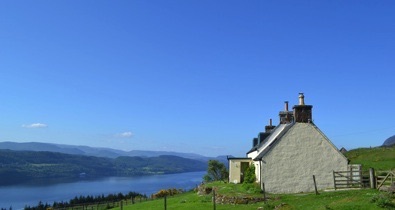 The uninterrupted views of Loch Ness are spectacular – and when you arrive at the cottage you can enjoy the panorama from the three bedrooms (one ground floor), living room and garden. Inside, the cottage is cosy and tastefully decorated, with modern kitchen and bathroom and convenient second downstairs loo. There’s plenty of space in the large porch for muddy walking boots and outdoor clothing. On arrival, we found a welcome hamper of wine, delicious home-made lemon cake and eggs produced by free range hens on the owner’s farm. There was plenty of hot water, fluffy towels and good quality bedlinen on extremely comfortable beds. No lumpy pillows or saggy mattresses here! Nicola, the owner, called in the next morning to welcome us and give advice on things to do in the area. There are the obvious attractions of Loch Ness – monster spotting opportunities abound in Drumnadrochit, the nearest town, where you’ll also find plenty of shops, eating options and a small supermarket. But we were far more interested in the wealth of natural beauty and walking trails available at Dundreggan and Glen Affric, both within a short drive. Travelling a little further afield brings you all that the city of Inverness has to offer – or you can go dolphin spotting at Cromarty on the Black Isle. As well as having so much of interest so close to hand, the cottage has pretty good green credentials. The locally-produced cake and eggs have been mentioned already, but there’s also a wind turbine on the farm that powers the electricity. And recycling all your holiday waste couldn’t be easier, with recycling boxes in the kitchen for plastics, glass and cardboard. But it’s the view that makes this place really special. Ever-changing, you’ll want to sit and gaze at it over morning coffee, afternoon tea, and evening glass of wine. Just watch out for monsters! Bunloit Farmhouse sleeps five in three bedrooms. Pets allowed. Book through Unique Cottages.